Pic. 1 illustrates BGP peering between the routers. All loopbacks have been advertised into BGP. 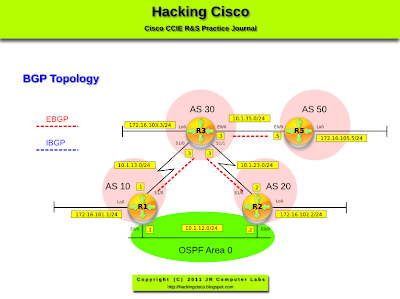 Configure OSPF between R1 and R2 using their E0/0 interfaces. Advertise their loopbacks into OSPF. Ensure that they are advertised with /24 network mask. The traffic between them takes the shortest path (through E0/0). The only configuration allowed to accomplish this should be done in the BGP context. Pic. 2 - BGP Table on R1. Pic. 3 - BGP Table on R2. Traffic from R1's Loopback towards R2's loopback goes through R3. Pic. 5 - R1' Routing Table. eBGP prefix (172.16.102.0/24) has the administrative distance 20 and is better than OSPF (110). Path is suboptimal. Pic. 6 - R1's Routing Table. Now, the subnet is known via OSPF with the next hop 10.1.12.2 (out E0/0). BGP backdoor changed its eBGP administrative distance from 20 to 200.